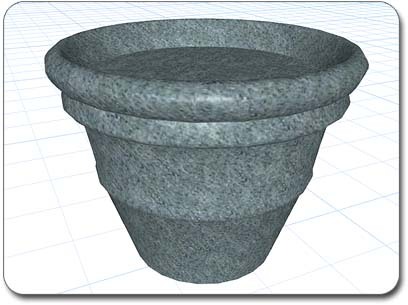 In this tutorial we will create a simple round planter using the Lathe object and the Convert to Custom Model tool. This tutorial will help you to better understand how the Lathe object works and how to apply different materials and shaders to your custom models. Open your Realtime Landscaping software, and begin a new landscape. Click Settings and Snap Settings, and set the Grid Size to six inches. Tip: This tutorial can be completed in either the Top-down/Plan View or the Perspective View, but we recommended that you periodically switch views to see your model from different angles. To create the planter model, we will first create a Lathe object. Lathes operate by creating a surface of revolution out of an outline, so we will be drawing the outline of the right side of the planter. In the Top-Down/Plan View, click the Lathe button that appears when the Modeling tab is selected. 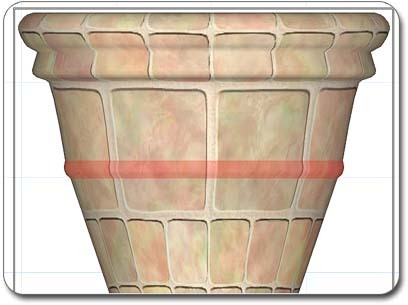 Next, draw the outline of the right side of a round planter as shown in the picture below. 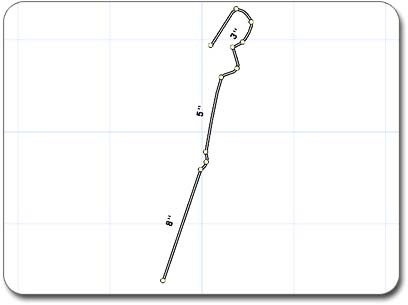 Once the planter outline is to your liking, adjust the Axis Offset property until the planter is the proper width. For my planter, I used an Axis Offset of six inches (6”). The Axis Offset property is located to the right of the screen when your lathe is selected. With your Lathe still selected, click the Convert to Custom Model button that appears when the Modeling tab is selected. This will allow us to assign materials, edit smoothing, and so forth in the following steps. In this step we will select the center band of polygons and make them smooth. To do this, click the Edit Polygons button that will appear to the right of your screen and select the band of polygons near the middle of your planter as shown in the picture below. Tip: To select groups of polygons, click and drag your mouse to create a selection box that surrounds the polygons you wish to select. With the band of polygons still selected, click Set Smoothness and set the smoothness to 100. Then click OK. Then click the Edit Polygons button again to leave polygon editing mode. The band of polygons was smooth before, but since we selected them and smoothed them separately from the rest of the planter, it will make the band stand out more and will contribute in a subtle way to the appeal of the planter. Using smoothing tricks such as this can make a big difference in the quality of your models. The planter is currently lying on its side, so we need to rotate it to an upright position. Doing so will cause half of the planter to go into the ground (since the rotation occurs about the model's center), so we'll need to set its elevation as well. With the model still selected, set the Rotate about X property to ninety degrees (90). Next, switch to the perspective view (if needed) and hold down the Ctrl key while dragging your mouse up and down. This will adjust the planter's elevation. When the bottom is even with the ground, it should snap into place. The modeling tools use the default material shown above. In this step we'll set the materials to something more appropriate for our planter. 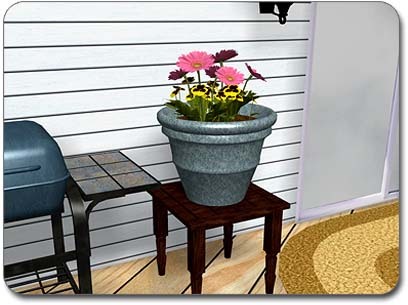 To do this, select your planter and click the picture of the material that will appear to the right of the screen. Once in the material library, click the Soil category button, and then click Terrain 66. This material was perhaps not intended for planters, but when applied to the planter it looks very nice. Our landscape design software includes a huge variety of material options, so you should be able to find one you like. It does not take long to see what is wrong at this point: the planter needs dirt. To show dirt in the planter, we will select the top of the planter and then change its material. 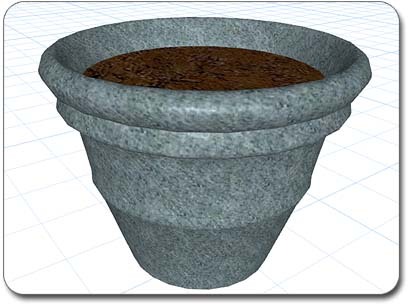 To do this, click Edit Polygons again and click the large round polygon near the top of the planter. If you have selected the correct polygon, it should appear as a circle. Now, with the round polygon selected, click the material picture, click the Ground category button, and then click the material Ground 5. Then click Edit Polygons again to leave polygon editing mode. Our planter is almost complete, but it would be nice to make the body a bit shinier. 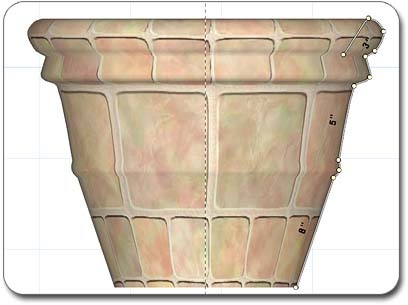 By doing this, we are sending a message to the viewer that the planter material is a glossy ceramic or plastic, which greatly increases the realism. To make the planter shiny, first make sure you have the planter selected but are not in Edit Polygon mode. Next, click the Shader drop-down menu and select Shiny. Feel free to experiment with the other shaders on the list as well. Finally, we can add the planter as a permanent addition to our library. To do this, select the planter and click Tools > Model Creation Wizard. Follow the prompts of the wizard, and select Accessory when asked what kind of model you are creating. Once the wizard is complete you will have completed this tutorial. Congratulations! 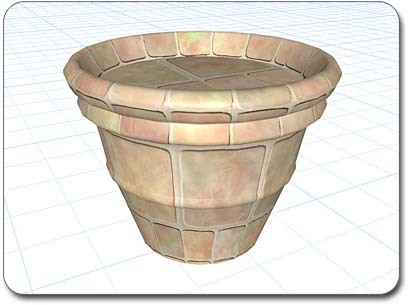 You have now created a custom 3D planter which you can easily add to your future landscape designs.